As you probably know, Aidan and I had the opportunity to share our story with some Yale Pediatric Nursing students. It was a great experience. Our biggest take home point was that Aidan is more than his diagnosis. He’s a singer, and a Pease Greeter, a boy who loves sledding, and is part of a family with other stuff going on as well. I understand that the medical community needs to focus on his medical issues, but it’s important to remember that’s only a piece of his life. We also talked about the fact that words matter. Medical words can sometimes be misunderstood and medical descriptors can be poorly described and unhelpful. Medical terms also come with an emotional weight. I shared a list of medical terms that have been used for Aidan. It doesn’t matter how accurate they are. I would write a list that says things like: hard worker, best ever giggle, super loyal brother. We also talked about our care notebook. I showed them the list of contacts and medical history that every provider gets from me. They instantly know who to send notes to, including myself. I also write down all medical events as they occur so I don’t sit in the doctor’s office trying to remember. We’ve received notes that have errors so it’s important to take those with a grain of salt. Aidan is more than his diagnosis. He looks so handsome!!! 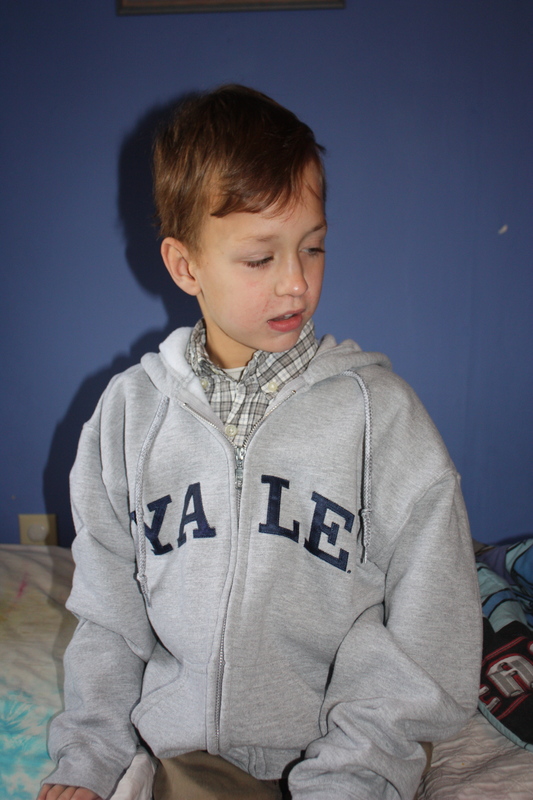 Love the Yale swag. It appears to me a general term, which is hardly helpful when you are talking diagnosis. If one says, for example, that the ‘child’s reflexes are retarded,’ we are talking about a specific function of the body, but to call an individual “retarded,” does not define what is really going on. It might even hinder the process of care because of its vagueness. He sure is a handsome devil, that Aidan.